A sleuthing bookstore owner may be too clever for her own good. 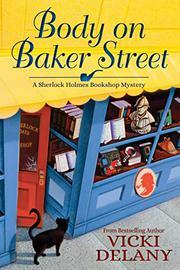 English transplant Gemma Doyle owns the Sherlock Holmes Bookshop and Emporium and, together with her friend Jayne, the adjacent Mrs. Hudson’s Tea Room in a coastal Massachusetts town. Linda Marke, personal assistant to bestselling author Renalta Van Markoff, excites and alarms Gemma by asking her to host Renalta’s book signing in two days’ time. Leaving her assistant to keep things running, Gemma dives into everything that must be done, including a list of special requests from Renalta, and soon all is ready to welcome the flamboyant author, who has many fans and more than a few enemies. Renalta’s protagonist is Baker Street landlady Mrs. Hudson, who is having an affair with Holmes and often outdoes him in the investigative department, an idea Gemma’s friend Donald Morris finds repugnant. While having dinner out with Jayne, Gemma is treated to the spectacle of Renalta, her publicist, Kevin, and Linda listening to a tirade from a woman named Paige, who accuses her of stealing the idea for her first book. Both Donald and Paige cause a scene at the signing, but Renalta is merely amused until she drinks from one of the special water bottles she ordered and keels over dead from what Gemma immediately suspects is cyanide poisoning. The fact that Gemma and Detective Ryan Ashburton have a past and maybe a future may be the reason Detective Louise Estrada warns her to stay out of the case after clashing with her over a previous murder (Elementary, She Read, 2017). Gemma, who has no intention of letting Donald be blamed for the crime, turns up many well-hidden secrets that point to other suspects. Remarkably, the heroine, who is often indeed annoyingly like Sherlock Holmes, manages to solve the mystery without alienating all her friends.